Grover Pro Endorser Dr. Scott Herring has had a busy summer, recently completed a performing and teaching trip to China. Scott visited Yantai, which is on the coast, about a one hour flight from Beijing. 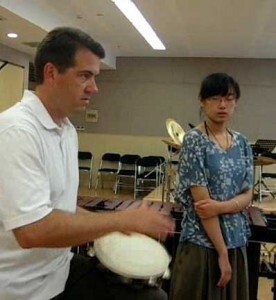 In addition to performing with the Rosewind Duo at the Yantai Cultural Center, he was the first professional Western percussionist to visit the area. The numerous young, aspiring, Chinese percussion students were thrilled to be able to learn from someone of Scott’s caliber and abilities! At the end of his visit Scott was honored to receive several invitations to return to Yantai, Xi’an, and Jinan, China. Dr. Scott Herring is an Assistant Professor of Percussion at the University of South Carolina in Columbia, South Carolina.